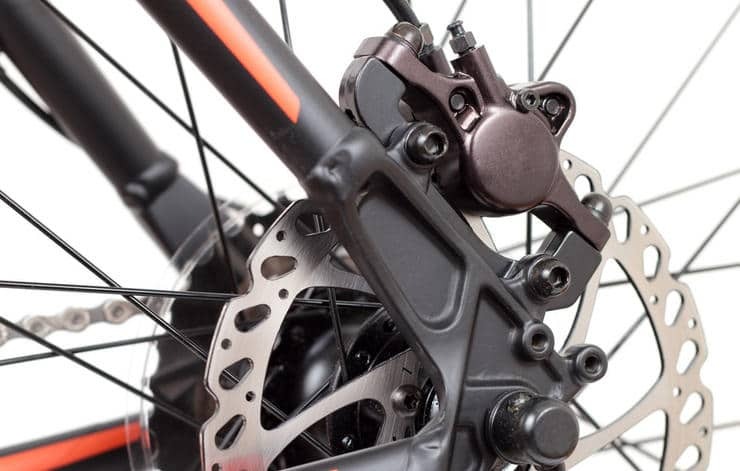 The brakes that were once only a staple on mountain bikes have become the new standard. From the different types to maintenance, here’s everything you need to know. It’s no wonder: With their excellent stopping power, superior speed modulation, and better all-weather performance than traditional rim brakes, disc brakes make huge impacts on your ride. But they can be heavier and sometimes challenging to maintain. Don’t let that stop you from investing in them. Here are the parts of disc brakes you should know, and some quick fixes to their most common mechanical problems. What’s even better is that great braking power is now available at almost every price point. And while disc brakes make huge impacts on your ride, they can be heavier and sometimes more challenging to maintain. So whether you’re a holdout or already rocking them, here’s a basic guide on disc brakes and how to make the most of them. Fix this by loosening the two bolts attaching the caliper to the frame or fork just enough so the caliper can move slightly side to side. Wiggle the caliper to make sure it moves freely, then pull the corresponding brake lever, hard. This will clamp the caliper to the rotor. Hold the brake lever down to keep the caliper in place, meanwhile tightening the top bolt until snug. Tighten the bottom bolt until snug and then re-tighten the top bolt to torque spec, then the bottom one. 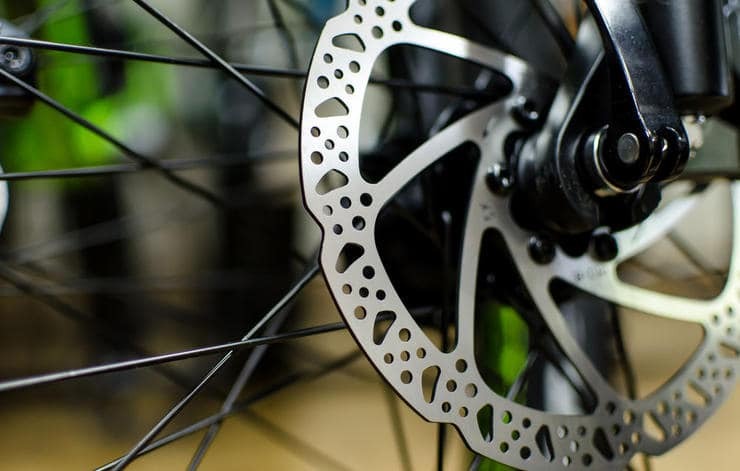 Rotors come as small as 140 millimetres in diameter for road and cyclocross applications, all the way up to 205mm for downhill mountain biking. Generally, road and cyclocross use 140-160mm, XCO uses 160mm, trail riding uses 160-180mm (sometimes a mix, with the larger rotor up front), enduro uses 180mm, and DH uses 200-205mm. Larger rotors are able to dissipate heat over a larger surface area, but are heavier, so you’ll want the smallest rotor you can get away with for the type of riding you generally do. Brake pads are found inside the calipers. 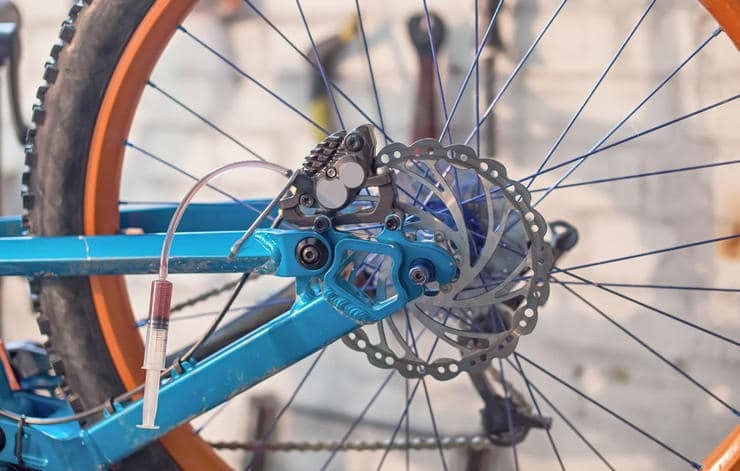 They’re designed to clamp down on the rotor at high speeds, which means their main job (besides stopping your bike) is to hold up under heat and friction. 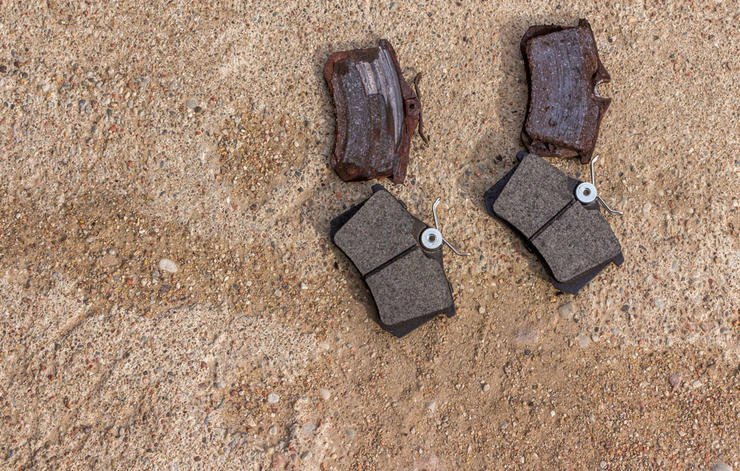 There are two main types of brake pads. Resin brake pads (also called organic) are composed of organic materials like glass, rubber, and fibrous binders bonded together with resin. Sintered brake pads (also known as metallic) are made of metallic grains that are bonded together at high pressure. In terms of feel, resin pads are quieter and have a stronger sense of bite. They’re better at managing heat, but they can fade as heat builds up. They also wear more quickly, particularly in muddy conditions. Sintered pads are the choice for riders who do mostly downhill mountain biking. They produce more heat but are less susceptible to its effects; and they last longer under heavy use and in wet conditions. Resin pads are what most brakes come with, but you should consider switching to metallic if you’re bigger, ride downhill terrain, or ride mostly in wet weather. If you’ve checked your caliper and rotor but still hear squealing when braking, it can mean that the braking surface (including pads and/or rotors) is contaminated and needs cleaning. Detach the wheel and use isopropyl alcohol on a clean rag to wipe off the rotor, then remove the pads and clean them as well. It’s also a good idea to wear disposable latex gloves; you’re trying to get dirt and oil off the braking surface, not add more. Make sure to let the pads dry completely before reinstalling. SRAM recommends replacing pads when the total thickness of the backing plate and the pad material is under 3mm. Shimano says that when the pad material alone is less than half a millimetre thick, it needs to be replaced. If you switch pad type (resin to metallic, say), swap your rotors as well; the pads and rotors pair by “bedding” small amounts of the pad material on the rotor, which means an old rotor won’t get optimal performance with a new pad type because it’s already bedded to the other kind of pad material.